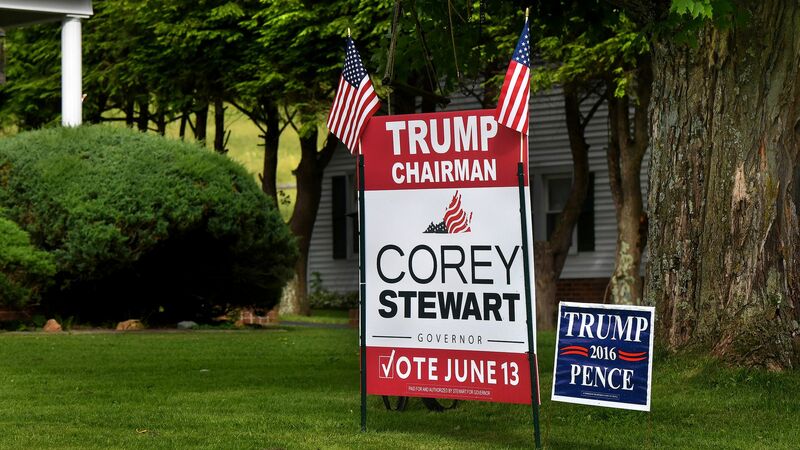 President Trump congratulated Corey Stewart on Wednesday, after Stewart took a victory in the Virginia Republican Senate primary race on Tuesday night, saying he has a "major chance of winning" against "a total stiff, Tim Kaine." The big picture: Virginia went blue in the 2016 election for Hillary Clinton, and Stewart — a pro-Trump candidate who has received attention for defending Confederate symbols — faces an uphill climb vs. Kaine. Stewart has promised voters a "vicious" campaign for the Senate seat against Kaine. He called Paul Nehlen, a "pro-White" congressional candidate, his "personal hero" last year, according to WaPo. He has since disavowed Nehlen. He was the chair of Donald Trump's Virginia campaign during the 2016 election, the Richmond Times-Dispatch reports, "before being fired for a rogue anti-establishment protest." He said Tim Kaine's son should be send to Guantanamo, per the Times-Dispatch, because of charges from a left-wing protest. Kaine called Stewart: “A cruder imitation of Donald Trump who stokes white supremacy and brags about being ‘ruthless and vicious.'" He sat down for an interview with Mike Cernovich — part of the self-described "new right" — for an interview after being fired from Trump's Virginia campaign, and was endorsed by a "prominent member of the neo-Confederate movement," per CNN.